Just as Star Wars has its Millennium Falcon and Star Trek has its Enterprise, HMS Bounty gained its own spotlight on the notorious side in the story of its own mutiny. The mutiny occurred on board of HMS Bounty on 28 April 1789 near Tahiti while the ship was under the command of William Bligh. Interestingly and fortunately, the mutiny was bloodless and Bligh was set afloat in a small boat with his loyalists by the lead mutineer, Fletcher Christian. In order to avoid detection, the mutineers then variously landed and stayed on Tahiti and Pitcairn Island, the latter bringing with them several Tahitian men and women. Officially called the Pitcairn, Henderson, Ducie and Oeno Islands, the Pitcairn Islands are a group of 4 volcanic islands jutting out in the middle of the South Pacific almost equidistant from Peru to the east and New Zealand to the west. They are officially a British Overseas Territory but they employed New Zealand Dollars as their official currency. Other cachets with the 2nd and 3rd sets of stamps, all from the definitive set of 12. Notice that the postmark mentioned Adamstown, the capital and only settlement on the island. 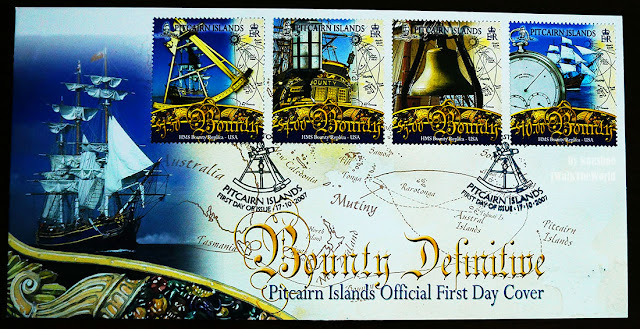 The philatelic bureau, which maintained the islands' philatelic sales, is based on New Zealand for convenience in facilitating sales and postage (Pitcairn Islands are really very isolated). Whether the FDC is really sent to postmarked in Adamstown and back to be sold in New Zealand is a question I am interested in. 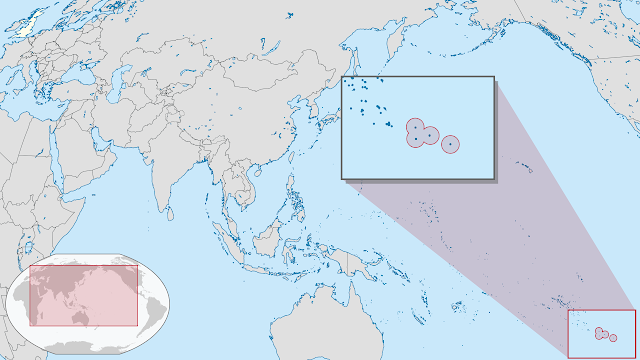 Although there are four of them, only Pitcairn Island, second largest of them, are inhabited. Henderson Island, the bigger brother among them supported various types of flora and fauna at the nearly inaccessible center while the other two islands are inhabitable. While total land mass is only 47km2, the islands are spread across several kilometers of ocean, with Ducie and Oeno more than 100km from Pitcairn Island. Accessing the islands themselves also presents itself as a challenge as they are surrounded by steep cliffs and covered by sharp corals in certain shores. Even Pitcairn Island is only accessible through Bounty Bay by longboats as the shore is not deep enough for any larger boats. 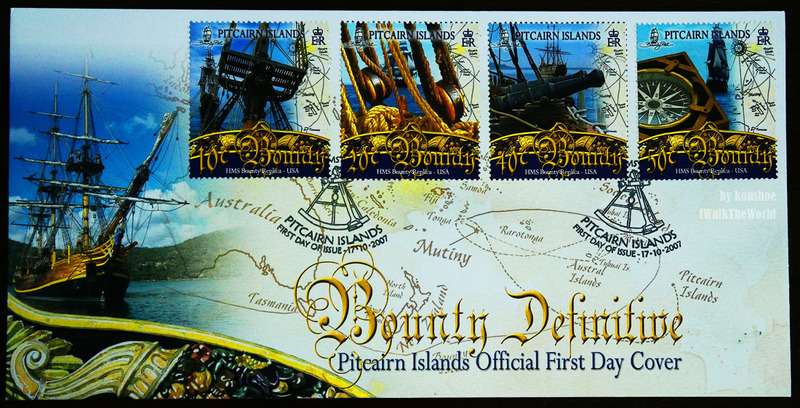 Pitcairn Island was first named thus when it was discovered by Midshipman Robert Pitcairn, serving aboard HMS Swallow in 1767 (22 years before the mutiny). Without the aid of the then newly invented marine chronometer, a device which could chart at a higher accuracy, the coordinate of the is land was off, making later rediscovery nearly improbable. This was also one of the reason why when the Admiralty tried to locate the majority of the mutineers they went home empty handed. A map showing the location of Pitcairn Islands and their remoteness (image taken from Wikipedia). 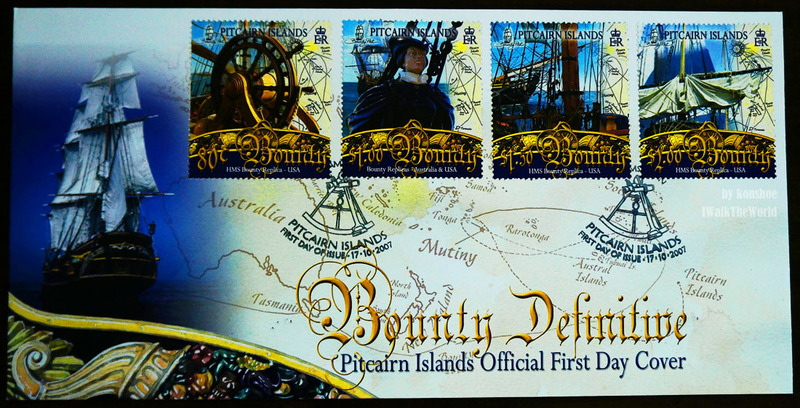 Fletcher Christian and the mutineers were not the first inhabitants of Pitcairn Islands though, nor were Pitcairn's the first sighting of the islands. The Portuguese sailor Pedro Fernandes de Queirós discovered Ducie and Henderson islands while sailing for the Spanish crown but sources were unclear which island was named which. Although the islands were uninhabited during the sightings, that had not always been the case. Polynesians were discovered to be the earliest inhabitants of the islands, living on Pitcairn, Henderson and another nearby Mangareva Island. For centuries they coexisted peacefully, relying on each other for trade and goods and forming crucial social ties. Civil war erupting on Mangareva eventually cut off ties with the other islands, leaving the latter with limited resources to go extinct. The replica Bounty was employed as the Edinburg in the movie Dead Man's Chest. 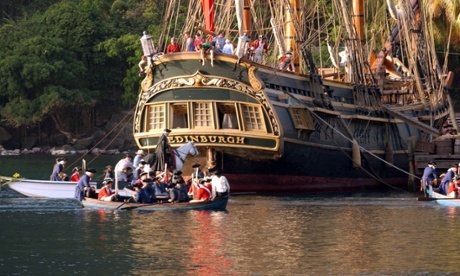 The replica was unfortunately sunken by Jurricane Sandy in 2012 (image taken from The Guardian). And if you are wondering what was featured on the most expensive stamp of the series, the NZD10 stamp, as I did, it was a marine chronometer, the aforementioned item employed to improve accuracy in charting. The first version of such watches made for sailing was made by Larcum Kendall, which is now known as K1. Those most accurate versions were carried by James Cook. One of the second version, created to be cheaper at the cost of accuracy, was passed to William Bligh, the captain of Bounty. During the mutiny, Christian took it with him to Pitcairn Island and upon the K2's return to England, gained fame. The replica of Bounty was seaworthy, having been employed to reenact the original journey. Unfortunately it met its demise at the hands of Hurricane Sandy in 2012. Since Pitcairn Islands issue a new definitive every 7 years, it will be interesting to see what will be featured in their 11th definitive in 2014 or 2015.